Report Scheduler 3.0 will allow you to generate and schedule your existing Crystal Reports for Printing, Export or Email. It now has a wide range of export options including PDF. It also has the ability to Schedule your reports to be Emailed as an attachment in a variety of formats to anyone or group from your address book. 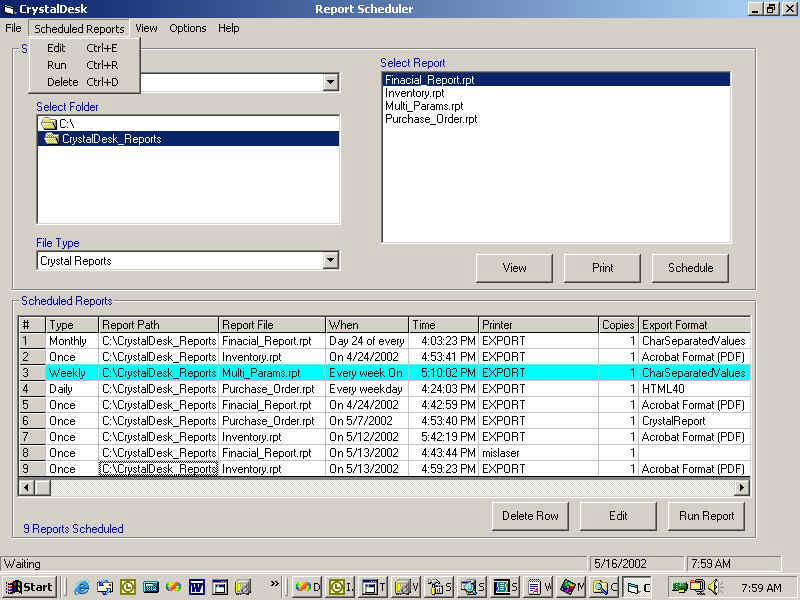 Report Scheduler can also be used as a Viewer, that can view, print or export any of your existing reports on demand. With a user-friendly interface you will be able to schedule reports based on Single, Daily, Weekly or Monthly Schedule. Scheduled Printing enables the user to select the number of copies and the Network printer where the Crystal Report will be printed at the date and time specified. Scheduled Exporting enables the user to select the export format type and location where the file will be saved at the date and time specified. Export formats include Microsoft Word, Rich Text (RTF), Excel, CSV, HTML, and PDF (requires Crystal Reports 8.x). Scheduled reports can be later edited. Reports that were missed while running a scheduled report will now be run upon completion.